The Scott sisters – Sister Jeanne, Sister Rosaleen and Sister Eileen (posthumously) – have been named “Spirit of Saint Joseph” award recipients by St. Joseph High School in Natrona. The award was established by the high school to recognize alumni and friends whose everyday lives exemplify the school’s patron. The three sisters are graduates of the high school. 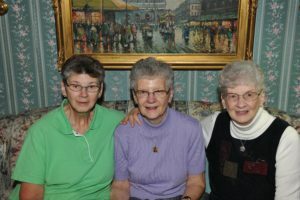 “Like the Sisters of St. Joseph who taught them at St. Joseph High School, the Scott Sisters carried their joy and spirit to schools, parishes and hospitals where they have faithfully served,” wrote Father Frank Mitolo, chaplain at the Motherhouse, in a letter of support.